To understand what is possible with 3D printing you have to understand the limitations of the material you can print in. 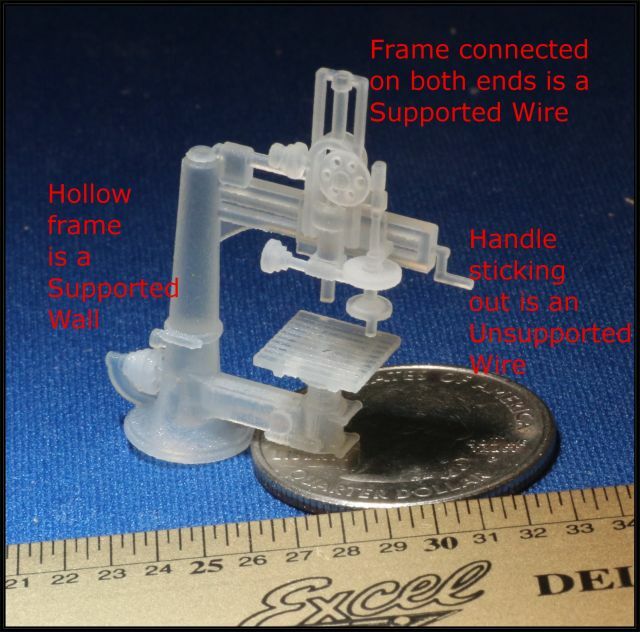 Shapeways, the company that prints my models, has guidelines for the minimum thickness for their different materials. The two I most commonly use are Strong and Flexible, which I’ll call “WSF” (White Strong Flexible) and Frosted Detail , which I’ll call “FUD” (Frosted Ultra Detail). Each of these materials has advantages and disadvantages, and the model you are making determines which material you want to use. I’ll talk about metal (which is really impressive) and full color in a later posts. Before we talk about the materials, we need to discuss two terms- Walls and Wires. A wall is a flat part of a model, well, it might be curved. Take a look at this Radial Drill Press (This was a test model, it was missing some gear teeth, and was printed in FUD). The large frame is hollow. Since it is connected to itself in a type of cone like structure, it is considered a supported wall. If a wall is not supported on at least two sides, it is an Unsupported wall. On the right is a handle sticking out. Since it’s only supported on one end it’s an unsupported wire. Although this is a cylinder, a wire can be square, triangular or just about any cross section. The arm of a human figure would be considered an unsupported wire if it was sticking out. On the top is a frame. Since it’s supported on both ends, it’s a supported wire. All this is important because each of these features have different design specifications. WSF has the advantage of being cheaper, but has less detail and has a slightly grainy surface. Some models can be polished which smooths it and gives it a shinny surface, but most importantly, it won’t print in as much detail as the more expensive FUD. Model made in FUD are more expensive, but have a smoother finish and finer details allowing you to do models that won’t work in the SWF material. Below I have made a chart that shows the minimum dimensions WSF and FUD can be printed in for various types of features. The features are on the left, and you can look across to see the minimum dimensions possible in each scale in inches (If you think in Metric I’m sorry- I’m too old to change now, but I will post a Metric chart). If you look at an unsupported wire- think of the handle on the radial drill press above, in Z scale it would have to be scale 9 inches in diameter/ That’s pretty big. In N Scale it would have to be 6 1/2 inches, and in HO 3 1/2 inches. At 3 1/2, although too big in diameter, it doesn’t look too bad. The model shown is HO scale. Of course in the large scales it’s even better, but in 3D printing cost is partially dependent on size, so there’s another trade off. Next time- Embossed and Engraved Details.